What one product has been proven to be the ultimate source of Building muscle? The Best Muscle Building Product in the world costs nothing and everyone has it. It is the human body. The human body is capable of building muscle at a rapid rate all by itself when properly stimulated. That means no supplements, no strange workouts, and no spandex. The only question is what’s the best way to stimulate the muscles? The answer as you may have guessed by the title of this website is Isometrics. 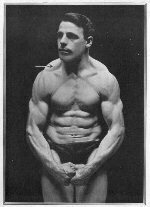 Numerous studies including those conducted in the early reports by Bob Hoffman, the founder of the York Barbell Company and Maxick the co –developer of the Maxalding method as well as recent studies such as the Nautilus North have all confirmed that Isometrics is by far The Best Muscle Building Product. In fact the Nautilus Study showed that from one Isometric Workout lasting no longer than ten minutes performed just once, resulted in the growth over 9lbs of lean muscle tissue after six days of rest! At the same time the subject lost 9.3lbs of fat. He completely changed his physical appearance from one workout. A natural question you may be asking at this stage is how? If you’ve ever performed conventional weight training where you lift or push an object from a stretched elongated position to a short contracted position or vica versa you will be familiar with lifting a given weight for a number of repetitions and sets (a series of repetitions) and depending on which training philosophy is endorsed this may take the form of 1-5 reps, 10-12, 15-20+. The object of this training is to fatigue the muscle tissue and exhaust the muscle fibres and stimulate the muscle to grow larger and stronger. The reason there is varying rep ranges and different theory’ is because the muscle is never totally fatigued until the last few reps of a set. During different parts of a lift different fibres in the muscle contract while others relax, with the muscle being placed in the most contracted state only a fraction of a second. Enter isometrics. Applying isometric principals to weight lifting or any training for that matter results in the maximum number of muscle fibres being recruited for the entire exercise, which can last up to 7 seconds. In this manner you fatigue the muscle and stimulate it with far greater intensity than conventional training. You can also cut your total time working out to as little as 10 minutes as opposed the conventional 1-2 hours. That's just one of the reasons it's the best muscle building product. As a result of this increased intensity you also have to allow for additional recovery and repair time. Thus you may start out by working out every 3 days or so and when you have sufficiently advanced you may only workout once or week. Some exceptional athletes only workout once a month and still make astounding and incredibly impressive gains with every session. There is no supplement, program or magic pill that can compete with the gains made through the scientifically verified training principals of isometrics - it is by far the best muscle building product available and you have access to it 24/7. If you want to get the body you want fat and improve your strength and fitness I highly recommend that you check out my complete Isometric Training Guide - 7 Seconds to A Perfect Body. It will teach you everything you need to train your entire body. No equipment, no gym - nothing needed except you and less than 5 minutes. Check it out - here. I understand if you have trouble believing this. I did too and I was an experienced fitness instructor and personal trainer. Then I tried it. On my first attempt utilising a leg press machine to allow for safety I maxed out the machine. I had never experienced the feeling of fully stimulating a muscle until this. It was like doing the very last rep of a heavy session first. No time wasted, no intensity lost. A week later I had to by a new uniform, my old one didn’t fit. Fitness Programs For Life - A unique approach to fitness using The Alexander Technique. Programs designed to help you get the best results from your training. Now that you know what the best muscle building product is you can learn how to use it. Read the articles on this site, they contain great information to get you started on Isometrics and you can experience the incredible gains that I and hundreds of my clients have felt.